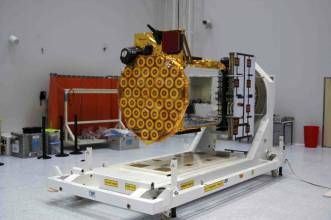 GIOVE-B, the second Galileo in-orbit validation satellite, has arrived safely at the Baikonur Cosmodrome in Kazakhstan, where it is undergoing pre-flight checks in preparation for its launch early on April 26. After completing final tests at the European Space Agency (ESA) space technology center in Noordwijk, The Netherlands, the spacecraft was transported to Baikonur aboard an Antonov An-124 cargo aircraft. 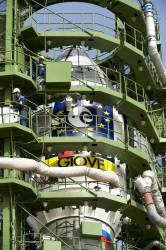 Unavailability of an upper stage of the Soyuz launcher will delay launch of the second Galileo In-Orbit Validation Element satellite (GIOVE-B) until at least March 2008. The most recent schedule had called for a late-December launch from the Baikonur Space Center in Kazakhstan. 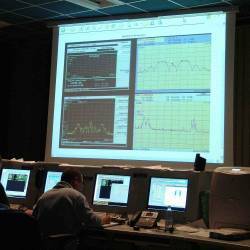 Already behind schedule as the result of an electrical short that caused widespread damage to the spacecraft during laboratory tests in summer 2006, the Galileo program’s latest postponement reportedly stems from the lack of a Fregat module. Fregat is the portion of the Russian rocket that releases the spacecraft into its final orbit (shown with GIOVE-A in accompanying ESA photo). As the clock runs out on the Galileo Joint Undertaking (GJU) that has guided the institutional development of the European GNSS program for the past four years, negotiators from the GJU and a consortium seeking to build and operate the system are nearing completion of a “head of terms” agreement.